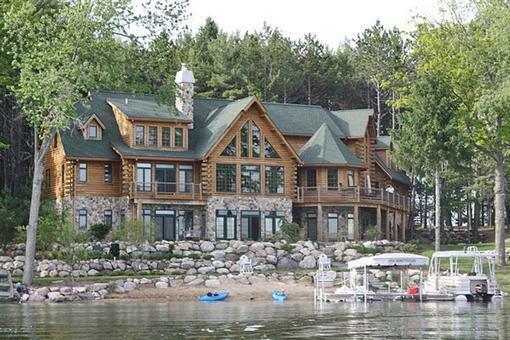 Sensational lakefront living! This lodge style home with its spacious and graceful style will leave you with a cozy feeling. Wonderful spaces to live and entertain. Set on Horsehead Lake in Mecosta County, this home will give you all the things you are looking for in a lakefront home. The main living is a spectacular open space with views of the lake, a gourmet kitchen complete with a wood fired pizza oven, rotunda dining room and a large boulder wood fireplace set in a lodge style room with large log beams and staircases. The lower level is a cape-cod style space that spills out onto the patio. From there step down to the lake through the beautifully landscaped grounds. There is much to see in this five bedroom home. Amenities include wood floors, polished granite, hand-crafted cabinetry, high-end appliances, suite style bedrooms, radiant heat, generator and many extras! Make your dreams come true here!